Chamber music is a form of classical music, written for a small group of instruments which traditionally could be accommodated in a palace chamber. Most broadly, it includes any art music that is performed by a small number of performers with one performer to a part. The word "chamber" signifies that the music can be performed in a small room, often in a private salon with an intimate atmosphere. However, it usually does not include, by definition, solo instrument performances. From the sonatas, specifically the trio sonatas, (ex. works by Arcangelo Corelli) evolved the string quartet which uses two violins, a cello and viola. Examples of string quartets are works by Franz Joseph Haydn. In the late 19th century, the piano quartet (piano, cello, violin and viola) emerged with the works of such composers as Antonín Dvorák and Johannes Brahms. In 1842, Robert Schumann wrote a piano quintet (piano plus string quartet). 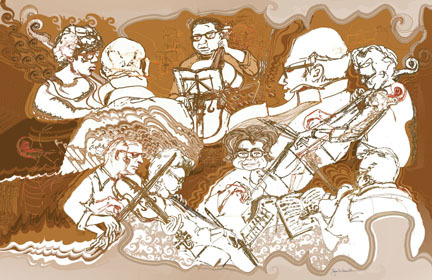 During the 20th century, chamber music took on new forms combining different instruments including the voice. Composers such as Béla Bartók (string quartet) and Anton von Webern contributed to this genre. Some of the greatest composers of classical music composed masterworks in the chamber music genre. Chamber music is an intimate gathering of music making. 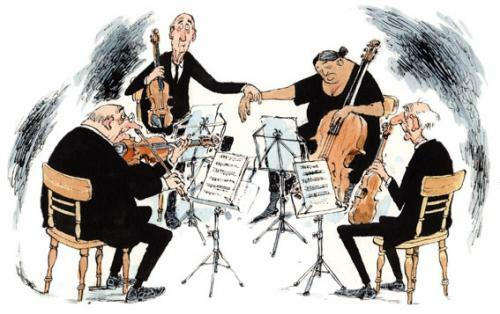 Unlike, a symphony or an opera, chamber music is much suited in a smaller room, full of intimacy and warmth. 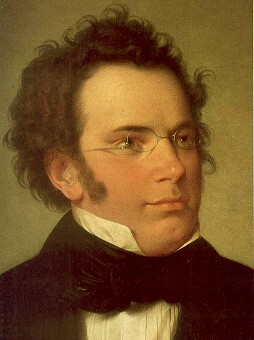 In his 31 years, Schubert devoted much of his life to chamber music, composing 15 string quartets, two piano trios, string trios, a piano quintet commonly known as the Trout Quintet, an octet for strings and winds, and his famous quintet for two violins, viola and two cellos. Schubert's music, as his life, exemplified the contrasts and contradictions of his time. On the one hand, he was the darling of Viennese society: he starred in soirées that became known as Schubertiaden, where he played his light, mannered compositions that expressed the gemütlichkeit of Vienna of the 1820s. On the other hand, his own short life was shrouded in tragedy, wracked by poverty and ill health. Chamber music was the ideal medium to express this conflict, "to reconcile his essentially lyric themes with his feeling for dramatic utterance within a form that provided the possibility of extreme color contrasts." Widely regarded as a masterpiece; both among Schubert’s many compositions, as well as in the entire chamber music repertory, the C major "Two Cello Quintet" was composed in what were to be the last remaining months of his short life. The work was completed only a few weeks before his death on the afternoon of Nov. 19, 1828. However it was not until twenty two years later, November 17, 1850 that the work received its premiere performance. Another three years were to elapse before the work was published. The clip above was the Adagio of this beautiful work. The Trout Quintet is the popular name for the Piano Quintet in A major by Franz Schubert. In Otto Erich Deutsch's catalogue of Schubert's works, it is D. 667. The work was composed in 1819, when Schubert was only 22 years old; it was not published, however, until 1829, a year after his death. The piece is known as the Trout because the fourth movement is a set of variations on Schubert's earlier Lied "Die Forelle" (The Trout). Apparently, the quintet was written for Sylvester Paumgartner, of Steyr in Upper Austria, a wealthy music patron and amateur cellist, who also suggested that Schubert include a set of variations on the Lied. The video was the Theme and Variations of the 4th movement. c. String Quartet no. 14 in D minor "Death and the Maiden"
This Quartet which now delights the whole world and is among the most superb creations in the medium at first did not receive by any means unanimous enthusiasm. The first violinist Schuppanzigh (Ignaz Schuppanzigh - Beethoven’s "Milord Falstaff", first violinist of the famed Schuppanzigh Quartet which premiered many of Beethoven’s Quartets), who was not up to such a task on account of his advanced age, said to the composer after the play through, ‘Brother, this is nothing at all, let well alone: stick to your Lieder’ - at which Schubert quietly gathered up the parts and locked them up in his desk forever. The evocative power of the phrase "Death and the Maiden" resonates deeply, from medieval woodcuts to contemporary cinema; and such is the power of this image that commentary on this Quartet is likely as not to be full of blather. The title comes from the fact that the melody used as the theme for the set of variations which constitute the Quartet’s Second Movement is taken from Schubert’s song Der Tod and Das Madchen (Death and the Maiden) where it appears in the piano introduction representing the approach of Death. The Alban Berg Quartet played the first movement. Ludwig van Beethoven. Beethoven transformed chamber music, raising it to a new plane, both in terms of its content and in terms of the technical demands it made on its performers and its audiences. His works, in the words of Maynard Solomon, were "the models against which nineteenth-century romanticism measured its achievements and failures. "His late quartets, in particular, were considered so daunting an accomplishment that many composers after him were afraid to essay the medium; Johannes Brahms composed and tore up 20 string quartets before he dared publish a work that he felt was worthy of the "giant marching behind." The String Quartet No. 14 in C♯ minor, Op. 131, by Ludwig van Beethoven was completed in 1826. Together with the quartets op. 130 and 132, it goes beyond anything Beethoven had previously written. (Op. 131 is the conclusion of that trio of great works, written in the order 132, 130 with the Grosse Fuge ending, 131; they may be profitably listened to and studied in that sequence.) It is said that upon listening to a performance of this quartet, Schubert remarked, "After this, what is left for us to write?". The op. 131 quartet is a monumental feat of integration. Beethoven composes the quartet in six distinct key areas, closing the quartet again in C♯ major, with a Picardy third on the final chord. The Finale directly quotes the opening fugue theme in the first movement, prompting Joseph Kerman to note it as a "blatant functional reference to the theme of another movement: this never happens." The Große Fuge (or Grosse Fuge, also known in English as Grand Fugue), op. 133, is a single-movement composition for string quartet by Ludwig van Beethoven. A massive double fugue, it originally served as the final movement of Beethoven's Quartet No. 13 in B♭ major (op. 130) but was replaced by a new finale and published in 1827 by itself as opus 133. It was composed in 1825, when the composer was completely deaf, and is considered one of Beethoven's late quartets. It was first performed in 1826, as the finale of the B♭ quartet, by the Schuppanzigh Quartet. The Große Fuge is famous for its extreme technical demands and its unrelentingly introspective nature, even by the standards of his late period. It is the largest and most difficult of all of Beethoven's string quartet movements. The String Quartet No. 16 in F major, op. 135, by Ludwig van Beethoven was written in October 1826 and was the last substantial work he finished. Only the last movement of the Quartet op. 130, written as a replacement for the Große Fuge, was written later. It was premiered by the Schuppanzigh Quartet in March 1828. At last, I finished this!!!! Interesting read. Personally I would put Brahms at #1 though. Thanks, Art Rock. Brahms & co would be featured in the next posting.. I am hoping that I could post the 2nd part of the series today. I would put Mendelssohn up there. How to I find Parts 2&3? All times are GMT +1. The current date and time is Apr-25-2019 03:03.